Last year my friend Hayden Saunier, a poet and actor, came up with an idea to change up what a traditional poetry reading is like. She invited a handful of people to a meeting at her house, and there No River Twice was born. No River Twice is a poetry improvisational group. Our group poetry readings don’t have planned reading lists, reader orders or themes–they’re completely spontaneous and responsive to audience input. At a NRT reading, the poets take cues and suggestions from the audience and each other, so each performance is unique, the poems interconnect, weave and flow in a unique way that connects the readers to the listeners. We’re not inventing new poems on the spot, but we’re inventing new synergies, which makes each performance collaborative and new. We held our first public performance in January at Fergie’s in Philadelphia, and have had a few since. Our next one will kick off the new Caesura poetry conference in Phoenixville, PA, August 17. It’s hard to explain exactly what NRT is, so you should just come to one of our events–it’ll change the way you think about poetry readings. Find some of my books here on Amazon. While this is a prank, I think we’ve all be in real situations that were pretty close to this. 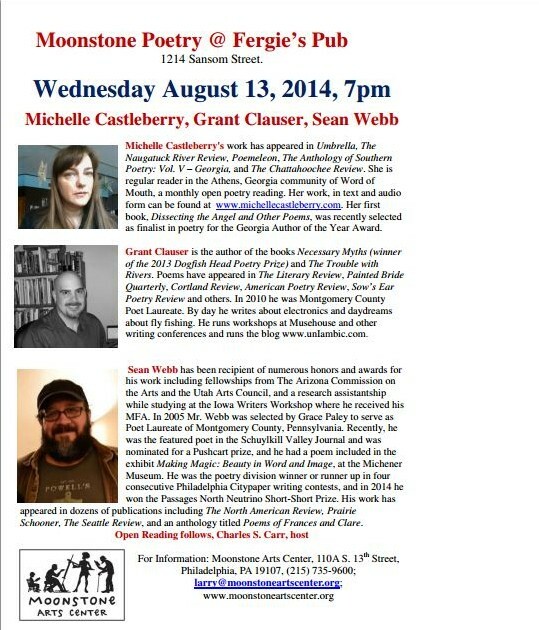 I’ll be reading at Fergie’s Pub (1214 Sansom St) in Philadelphia next week with Sean Webb and Michelle Castleberry. All the details in the picture below and here. It’s a fun spot so I hope to see lots of people. Here’s me reading three newer poems (they’re not actually from the book, as I state in the intro, but hopefully from the next book). The poems are Naming the Hurricanes, Ode to Scrapple and Ode to a Jackalope (which will appear in an issue of Gargoyle later this year). Recorded by Jill Frechie at Rosemont College. Sunday May 4th 2014, 2PM. Writers with Broadkill River Press (and that includes me) will be at The Writer’s Center in Bethesday MD. 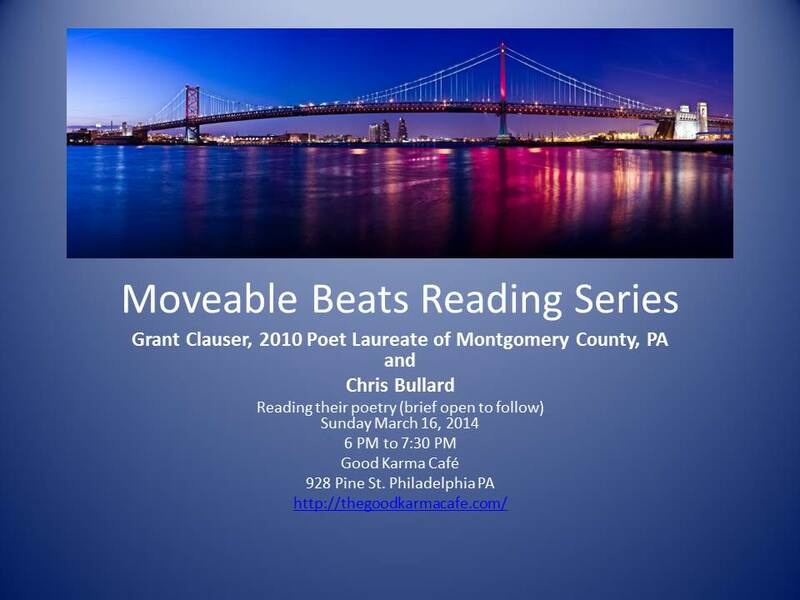 On February 1 at Musehouse in Philadelphia Hayden Saunier and I will be reading from our new books. You should go. There will be snacks and wine. And poems too. And books for sale. And people to talk to.